Markerless highly-detailed performance capture is an emerging technology in vision-based graphics and 3D video. For instance, a framework for generating mesh animations from multi-view silhouettes is presented in [Vlasic et al. 2008]. Achieving inverse animation by approximating dynamic mesh using rigid skinning has inspired researchers to convert video-based reconstructed mesh sequence into rigid kinematic parameters as seen in [de Aguiar et al. 2008]. 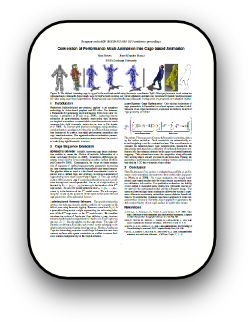 In contrast with previous techniques using skeleton-based animation paradigms, we describe an efficient linear estimation framework to convert non-rigid performance animation into cage-based animation. Our approach retrieves animation parameters through a single-pass minimization process without the need of an underlying rigid kinematic structure. cage performance capture ,performance capture using cage, cage-based deformation, template mesh processing, interative mesh editing, linear mesh deformation, space-based deformation, data-driven deformation, dense surface skinning, cage-based representation.